H1N1, or "swine flu," has put the world on high alert. In the United States specifically, it's estimated this new strain of flu virus — first identified in April 2009 and quickly declared a pandemic — has been linked to nearly 14,000 deaths, according to the U.S. Centers for Disease Control and Prevention (CDC). Because of its severity, the new communicable illness has sparked a flurry of media attention and raised public alarm. In fact, hygiene has become so top-of-mind that facilities across the U.S. are upgrading their restroom equipment to touch-free and making efforts to educate their staff on different measures to reduce the risk of catching H1N1 and other common influenza viruses. Hand hygiene as well as keeping surfaces clean and free from germs is regarded as a natural way to contain the spread of H1N1. In fact, the CDC says that the single most important preventative measure to help people avoid getting sick and spreading illness to others is through frequent hand washing. Americans recognize that good hand hygiene is an effective line of defense against viruses, but unfortunately few have changed their hand washing etiquette, according to studies conducted by the Soap and Detergent Association (SDA). In an ideal world, everyone would wash their hands after using the restroom. However, SDA studies have found that 25 to 35 percent don't. Educating building occupants on proper hand washing and how it can prevent cross-contamination is essential, especially during a pandemic. In fact, an unwashed hand can spread bacteria to every surface it comes into contact with, transferring germs to the next person who touches that surface. Flu viruses, including H1N1, can survive up to 12 hours on paper or cloth, up to 48 hours on nonporous surfaces like countertops, doorknobs and desks, and as much as 72 hours on moist surfaces, which help to keep the virus alive, according to the Cleaning Industry Research Institute (CIRI). This means that in an improperly cleaned facility, the H1N1 virus can remain alive, potentially infecting others through cross-contamination, for up to three days. While there is potential for cross-contamination in any space, the restroom is of particular concern because it is used for bodily functions and has numerous touch points. For example, in just one restroom visit, a building occupant may touch a doorknob, a stall door, a stall latch, a toilet seat, a toilet-paper dispenser, a toilet handle, sink faucet handles, a soap dispenser, a paper towel dispenser or hand dryer and the door handle to exit. That's 10 surfaces where a person can pick up germs and then spread them throughout the facility as they leave the restroom. Thorough hand washing in addition to proper restroom cleaning is the best way to prevent cross-contamination. In a move to get patrons to lather up, distributors say facility managers across the U.S. are encouraging hand hygiene through the implementation of touch-free products in restrooms. In fact, with facilities looking to minimize the potential spread of H1N1, distributors say there has been an increased demand for touch-free restroom fixtures such as soap dispensers, hand dryers, towel dispensers, and faucets. "To say H1N1 is impacting the sale of touch-free fixtures is probably the understatement of the year. The sale of touch-free fixtures for soap is off the chart," says Dan Josephs, general manager of Spruce Industries, Rahway, N.J., who added that his company has experienced at least a 300 percent to 400 percent increase in the sales of touch-free soap fixtures alone. Because people don't like to touch anything in the restroom, automating hand washing through the use of touch-free fixtures actually increases hand washing compliance, distributors say. "People want the touch-free advantage in public restrooms," says Teresa Farmer, sustainability consultant with Kelsan Inc., Knoxville, Tenn. "One thought that most people have is that Ôwho wants to crank a towel dispenser handle after washing your hands when you don't know who touched it before you.'" Research by manufacturers has shown that 90 percent of restroom visitors prefer a touch-free restroom. Other studies conducted by manufacturers suggest that 30 percent more people will wash their hands if touch-free products are provided. Touch-free dispensers deter patrons from using excess product, helping to ensure restrooms remain stocked with soap and towels. 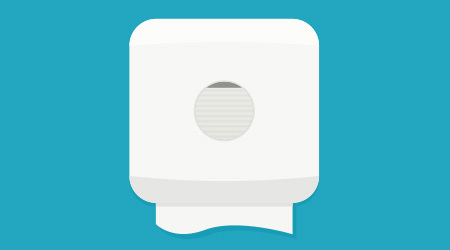 When using hand dryers, most patrons don't complete the drying process, leaving hands damp and contaminated. However, touch-free, high speed hand dryers dry hands quickly, so hands are more likely to get cleaned before exiting the restroom. With hygiene becoming more prevalent due to the current H1N1 pandemic, distributors say some select markets are beginning to embrace the touch-free movement. The general public has developed a phobia of germs over the last decade. Whether it was because of recent threats like avian flu or MRSA, and now the current H1N1 pandemic, distributors say these communicable diseases have led to heightened awareness regarding the importance of a cross-contamination free experience in facility restrooms. This is prompting facilities, such as educational facilities and office buildings to purchase touch-free restroom dispensers as a result, says Farmer. Because children are one of the main targeted age groups for H1N1 infection, distributors say the educational market has shown the most interest in touch-free restroom fixtures to help protect the health of students and faculty. Items such as soap dispensers and towel dispensers have been the top sellers. Distributors say educational facilities — K-12 and colleges — have taken a heightened awareness because of the number of outbreaks reported in the U.S. Many of these outbreaks have forced closures for weeks. By having schools install touch-free fixtures in restrooms, it minimizes the risk of cross-contamination and the spread of H1N1 and other flu viruses, says Chris Pratt, sales manager for E.A. Morse & Co., Middletown, N.Y.
"The less you touch in the restroom, the better you're going to be in terms of cross-contamination," says Pratt. Commercial office buildings also have shown interest in upgrading to touch-free fixtures in light of the H1N1 pandemic. In fact, in the month of November 2009 alone, Pratt says his company noticed an increase in the sale of touch-free towel dispensers and automatic faucets in commercial office buildings. Distributors say they don't have to do much coaxing to get facility managers to switch to these products as a way to reduce the spread of viruses like H1N1. "In an office environment, there is a loss of productivity when employees are absent," says Farmer. "Getting our customers to understand the benefits of keeping the occupants of their facility healthy is our main goal." Although distributors could jump aboard the H1N1 bandwagon, they say the current H1N1 pandemic has not changed how they are marketing touch-free products as a means for health protection and cost savings. "Under normal circumstances, we promote touch-free products by trying to educate the customer on germ prevention," says Josephs. "The less surfaces you touch, the less chances you have of contaminating your hands with germs." But in these current times with the market in complete media shock from H1N1, Daniels says if his company or other distributors were to push scare tactics, customers might think they are preying on their fears and concerns over H1N1 just to sell a product. "In this current market, I find it better to say less — the less is more approach," says Josephs "There is enough information on the street about the benefits of touch-free solutions and it is our job to help steer the customer in the right direction, gently. We want to educate but not scare."